Surrounded by National Forest on 3 sides is this 114 Acres tract of land inundated tall Ponderosa Pines trees, tall Piñon trees, Oak trees, with coop water, (possibly your own well, still checking up on that), electricity. 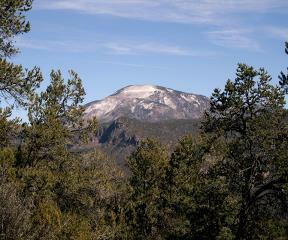 The tract runs from flat to moderate to steep, an elevation from 7200 ft to 8200 ft. Even have some red sandstone cliffs on it. There are fantastic views. 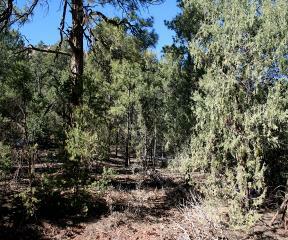 This tract is located 2.1 miles North of Soda Dam then 1 mile off a county maintained road. Resident deer are all over this tract and a lot more deer during the Winter. There are also some elk that Winter there also. 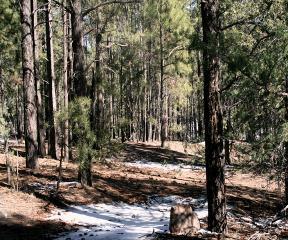 There are not a lot of large tracts left in the Jemez especially tracts that are have year around accessibility. The following GPS Coordinates will take you to the middle of the southeastern portion of the property, (or very lower portion), 35°49'5.57"N 106°40'37.94"W. The southeastern portion is the most accessible portion of the property. It will take a little work to access the upper part but the upper part is the most exciting of the whole tract.